In an ideal situation, a submarine’s captain could position his unmoving boat with its bow pointed directly at the side of an unmoving target and fire his torpedoes straight ahead, where they would inevitably hit the target. In real life, both the submarine and the target are normally moving in different directions, and the captain has to calculate the correct path that his torpedo will need to follow in order to get a hit. In World War I, this was accomplished using a circular slide rule called an “Iswas,” which continued to be the practice in the older submarines. Various navies developed their own electro-mechanical target computers, with the United States building the most sophisticated model. Most, like the “fruit machine” used in British submarines, were basic angle solvers, providing readings that would be manually input into the torpedoes. While certainly a good start, it still required the commander to “aim” his boat onto a particular bearing, and calculate the correct moment to fire the torpedo, which would have been manually set with what was predicted to be the correct gyro angle. The American Torpedo Data Computer (TDC) was a far more sophisticated device. In addition to the standard angle solver, it also included a real-time target tracking system, or “position keeper.” The TDC was linked to the targeting systems in the torpedo rooms, allowing continuous data updates right up to the moment of firing. 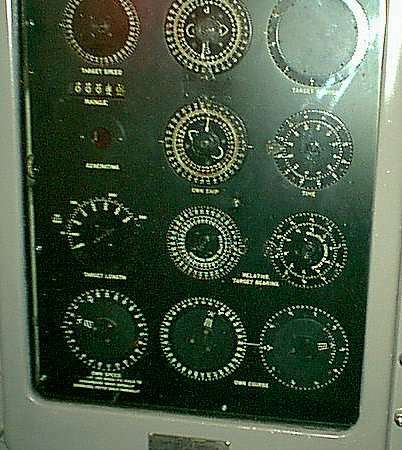 Based on the fire control equipment fitted to capital ships, the American TDC took “own ship” data from the submarine’s gyro compass and Pitometer log in calculating the submarine’s course and speed. Information on the target was entered manually. This would include the target’s course, bearing, range, speed, length, and the angle on the bow, a reverse target bearing, indicating where the submarine would be in relation to the target if viewed from the target. The TDC was also linked to the boat’s active sonar, integrating target range and bearing readings from that source. As radar became available, it was also linked to the TDC. Using these inputs, the TDC’s position keeper was able to calculate the predicted target course, and automatically set the torpedoes so that they would track correctly to hit the target. It wasn’t necessary to “aim” the submarine—the torpedoes would turn onto the correct bearing once they had travelled a safe distance from the boat. During the interwar period, it was thought that sonar range and bearing would be the most important inputs, as it was believed to be too dangerous to expose a periscope during daylight. Actual wartime experience quickly disabused the commanders of that notion. Periscopes turned out to be harder to spot than exercises had indicated—it probably should have occurred to someone that lookouts are a lot more effective when they know there’s a submarine around—and sonar wasn’t really accurate enough. Periscope attacks during daylight hours, and surface attacks after dark, proved to be most effective in actual combat. For night surface attacks, target bearings were provided by using the Target Bearing Transmitter (TBT), of which two were normally fitted, one at the front of the bridge, and a second on the cigarette deck at the rear of the bridge. The TBT was essentially a pair of high powered binoculars mounted on a pelorus, with an electrical tranmitter built into the base. Target bearings could be sent to the TDC by pressing a button on a handgrip.